Sometimes, you just need a friend to game with. But if all your mates are offline, there's another option: paying for someone to game with you. If you're happy to fork out between five and eight bucks an hour, you can pay for someone to squad up with you in Apex, League of Legends, CS:GO, Dota 2, Rainbow 6: Siege, Fortnite, and a range of games that aren't popular in the West. The service is called Daofeng Esports Games, and the proposition is pretty simple. If you don't have someone to group up with, Daofeng's marketplace will connect you with someone for a fee. It's predominately a service built around gaming, although there's also a section for non-gaming companions, like fortune tellers, singers, people who speak in certain dialects, someone to talk to before going to bed and wake-up calls. The site advertises primarily women, although there's a smattering of males (particularly former professional players) available as well. The site limits the maximum payout at 90 yuan (~$19), but there's nothing stopping users from privately bartering with a companion afterwards. A common theme among the blokes, particularly in Apex and CS:GO, is to advertise their kill/death ratio or other stats. You're not just paying for a companion; you can pay to get carried too. The service isn't new at all. A couple of years ago, Cecilia wrote about an almost identical experience about paying for Overwatch companions. The core difference was that there wasn't a centralised Western marketplace or site for gaming companions. 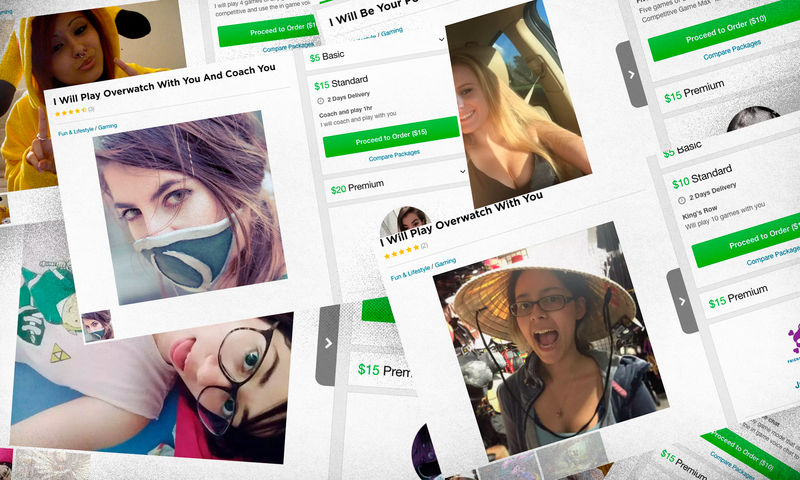 It was all running through Fiverr, where hundreds of women were offering coaching and companionship for $US5 to $US15, sometimes on an hourly basis or for a set amount of games. There are hundreds of such listings available now, ranging from a handful of bucks for Overwatch matches to $50 or more for YouTubers to do Let's Plays of your video game. Fiverr isn't exclusively focused on games though - like most gig economy sites - whereas Daofeng Esports Games is targeting a very specific market. Earlier this week, on Fiverr.com, I selected Biu's "Basic" package which, in exchange for $US5 ($7), granted me her company for five Overwatch games. In her profile's image, a helicopter selfie, Biu is wearing a t-shirt with Zelda's Link and sticking out her tongue. "If you want a good healer," her gig page reads, "I'm a Mercy main." A few hours later, my new, paid Overwatch companion and I queued up for a Quick Play match. Every user profile has a space where satisfied customers can leave little gifts and recommendations of their own, with a small leaderboard (not unlike Twitch) showing off those who have donated the most. It's a fascinating window into a side of gaming that seems certain to grow, even if it never takes off in Australia. Humans are social creatures, and from time to time we get lonely. Humans have often turned to paid companionship to fill that void, so it's only natural that video games would be another medium to facilitate that connection. For 45 yuan I'd be bloody expecting my companion to shot of a child or to throw a few thieves! I mean sure from talking to the person on the website you can exchange phone numbers which then leads to the exchange of sexual activity for payment but is that the site at fault? its no closer to that than literally any other "job"
Looking at the ratio of females to males I'd call them escorts. Or eScorts if you will. Yeah. That’s where I’m at with it. It's a fascinating window into a side of gaming that seems certain to grow... I don't know. The first service I heard about like this was GameCrush and that was in 2010. We're not exactly inundated with them 9 years on so I'd say that it probably just found its niche and sat there.